In this online journal, we’ve talked about Barbera as sort of the “other” fine red wine grape of Monferrato; the surprisingly diverse grape that might not be as quite serious as Nebbiolo, but is able to offer excellent quality in its youthful versions, and elegant longevity in its more age-worthy wines. That Barbera can do this is a function of the unique terroir of the Monferrato area itself. But there’s another red fine wine grape that has taken a liking to the special terroir of Monferrato, and in some ways it can be thought of as Barbera’s misunderstood adopted brother: the venerable Ruchè. In a lot of ways, Ruchè is Barbera’s opposite. For a long time in the Monferrato region, no one really seemed to know what to do with these grapes. Its origins were unknown, and unlike Barbera the maturation curve of this wine made it difficult to produce a wine that is fully ripe in its flavors without also having relatively high alcohol (around fifteen percent abv), and noticeable tannins. Add in the fact that these vines are prone to sunburn and produce a lot of leaves that have to be managed, and you’ve got a recipe for a grape that was exacerbating, to the point where it was used for relatively sweet wines with, it was assumed, little aging potential, and used mainly for local consumption. Today, He’s hardy, highly aromatic with notes of pepper, violets, roses, cherries, and citrus rind, and it balances its alcoholic potency and ample tannic grip with ripe red fruit flavors and palate liveliness. At turns on this website, we have compared Barbera in Monferrato to Michael Jackson, the Incredible Hulk, and James Bond. But this grape is different; powerful, poised, full of potential, and probably more than a little misunderstood, This is kind of a Monferrato vinous anti-hero. Ruchè is the Deadpool of Northern Italian red wines. Like Deadpool, modern Ruchè wine is the product of experimentation. After World War II, agricultural workers in the Monferrato area generally flocked to larger Northern Italian cities for the promise of jobs working for budding industries such as Fiat. In only a few decades, however, those manufacturing job opportunities migrated to other countries, and an already economically burdened area saw an influx of newly the jobless returning back to their family homeland in Monferrato. Enter the visionary pastor Giacomo Cauda, who, in an attempt to ease the economic suffering of his flock and bring a specific focus to the region of Monferrato, began an attempt to modernize the winemaking of Ruchè as a fine wine industry. He discovered that careful yeast selection allowed the creation of Ruchè wine that was powerful, ripe, uniquely quirky, balanced, and a natural match for the hearty cuisine of the region. Modern Ruchè was born. Cauda, mayor Lidia Bianco, and local producers of Ruchè went on to help establish quality requirements for Ruchè production, leading to the realization of Cauda’s dream, with a Ruchè DOC established in the 1980s, and the elevation to DOCG status of Ruchè di Castagnole Monferrato in 2010. 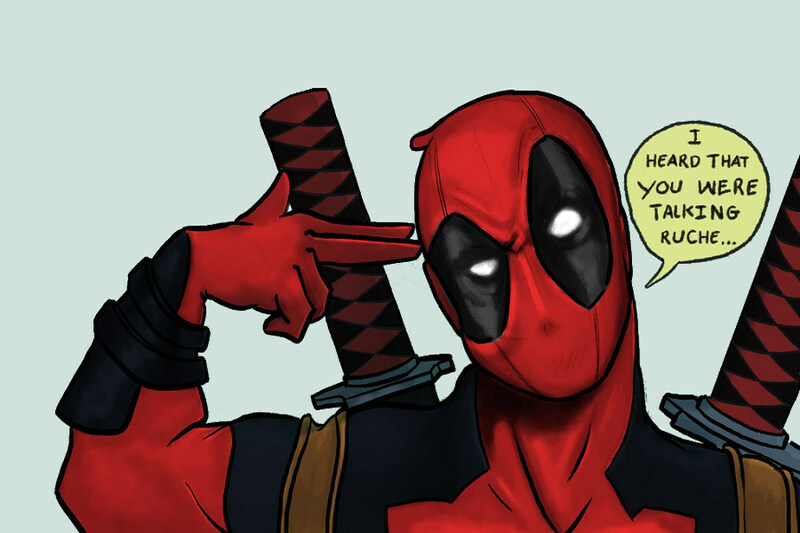 Deadpool is a powerful, precise adversary in battle, which (apart from the fighting, of course), is something that Ruchè has in common with him. Thanks to the work started by Giacomo Cauda, and now continued by the forward-thinking growers and vintners in the regions of Castagnole Monferrato, Grana, Montemagno, Portacomaro, Refrancore, Scurzolengo and Viarigi, this Docg shines in its modern form. Bright ruby red (just like the costume of our anti-hero) in color, its aromas of flowers and spice, wild berries and cherries, are all delivered with a precision that would make Deadpool himself a little jealous. And, like Deadpool, while approachable, our wine packs a serious punch (in this case, its weapons are a full-bodied texture, and ample tannic structure). But the thing that most likens Ruchè to Marvel’s now-famous anti-hero is its particularity. Ruchè wines are unique; not just because the wine itself is not easy to find (only about 700,000 bottles are made each year, and only about 30% of that production is exported), but also because of its quirky, fun combination of lifted, bright aromas and powerful texture. Like Deadpool, Ruchè isn’t for everyone. To love Ruchè, you need to love the unique. You need to appreciate the combination of rarity, fun, and potency. So… is the world ready for Ruchè from Monferrato? Well, the 2016 Deadpool film grossed over $783 million worldwide, broke several box office records, and as of the time of this writing was the highest-grossing film in the X-Men franchise, and also the highest-grossing R-rated film of all time. FIT FOR A KING: THE FIRST MENTION OF BARBERA D’ASTI?